Product #21350 | SKU H-PS45175E-K | 0.0 (no ratings yet) Thanks for your rating! Spanning a versatile telephoto range, the Lumix G X Vario PZ 45-175mm f/4-5.6 ASPH. POWER O.I.S. from Panasonic is a 90-350mm equivalent lens designed for Micro Four Thirds mirrorless cameras. The lens's optical design includes a pair of aspherical elements and a pair of extra-low dispersion elements, which help to control aberrations, distortion, and colour fringing in order to realise a sharp, colour-accurate image quality, and a floating elements system is also used to maintain clarity throughout the zoom and focus ranges. A Nano Surface Coating has also been applied to suppress lens flare and ghosting for greater contrast when working in harsh lighting conditions. 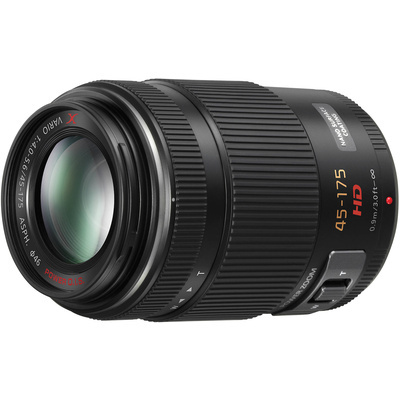 Complementing the imaging capabilities, this lens is also characterised by its power zoom design that affords smooth, controllable zoom adjustment via a built-in switch. POWER O.I.S. also helps to minimise the appearance of camera shake for sharper handheld shooting and a stepping AF motor, along with internal focusing design, contributes to quick, quiet focus performance to suit both photo and video applications. Long-reaching telephoto zoom is designed for Micro Four Thirds mirrorless cameras and provides a 90-350mm equivalent focal length range. A pair of aspherical elements help reduce spherical aberrations and distortion in order to achieve notable sharpness and accurate rendering. Two extra-low dispersion elements suppress chromatic aberrations and colour fringing for improved clarity and colour accuracy. Floating elements system is used to maintain consistent image quality throughout the zoom and focus ranges. POWER Optical Image Stabiliser (OIS) minimises the appearance of camera shake to realise sharper imagery when shooting handheld. Power zoom design affords a smooth, controllable zooming motion that is adjustable via the built-in zoom lever.